TA-50 Gear Lockers are ready to use when shipped and arrive fully welded with an open air flow design, 3 point locking mechanism, and a built in padlock hasp. Store uniforms, load out bags, gear, diving equipment and more! ​The built-in padlock hasp accepts up to a 3/8” shackle. TA-50 lockers are 42" wide, 78" tall, and 24" deep. An easy and sturdy storage system for all types of gear! 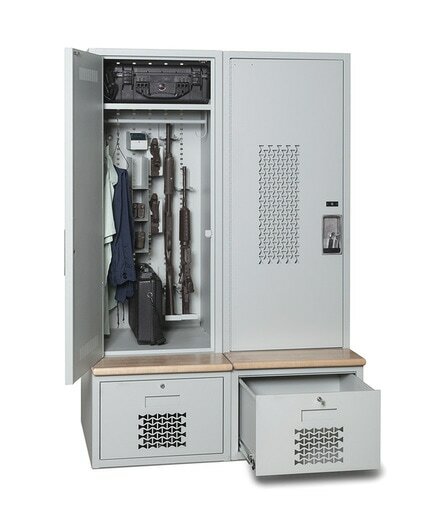 Most popularly used by S.W.A.T, Police, Fire Stations, and Emergency Response Teams, the Constable Gear Locker includes an adjustable shelf with a built-in hanger bar, two coat hooks, and a back panel that allows for weapon storing components to be incorporated. Heavy gauge all welded construction. Constable lockers are 24" wide, 76" tall, and 24" deep. 32" deep where the bottom drawer is. Compartmentalize smaller items, gear, bags, cases, and tools with the Duty Bag Locker system! Featuring a four part system, the locker can have a custom configuration if something other than the standard is required. A standard setup includes three upper compartments and one full extension drawer on the bottom. All sections can be fitted with padlock or keylock. The Duty Bag Locker is 18" wide, 78" tall, and 24" deep.